A Farm Storage Facility Loan helped the Belisles purchase and install a cooler that increased their apple storage capacity by 210 bins. They now have more flexibility when it comes to marketing their apples. John and Dorie Belisle own and operate BelleWood Acres in northwest Washington State, near the Canadian border. 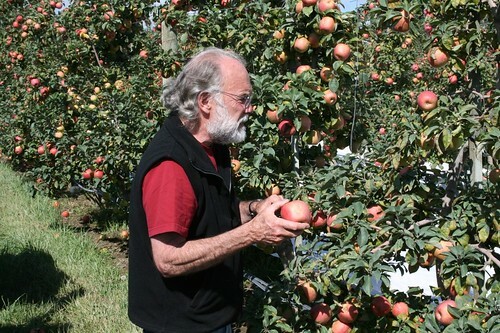 The Belisles and their family planted their first apple orchard in 1996 and have 31 acres of high density trees, which pencils out to about 25,000 trees. The Belisles started out selling apples to wholesale markets. After experiencing a downturn in the market, they knew it was time to diversify their operation and gain a competitive advantage to boost their margins when market prices drop. The Belisles wanted to open a retail store and had an agritourism model in mind. In 2009, they purchased property from their neighbor to establish the retail store. Before opening the storefront, the Belisles wanted to install an additional cooler to have a marketing advantage. 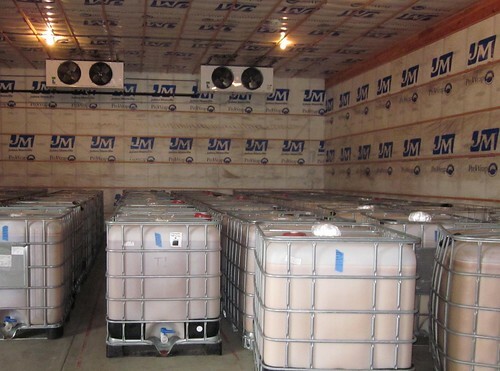 They used a USDA Farm Service Agency (FSA) Farm Storage Facility Loan (FSFL) to purchase and install a cooler that increased their storage capacity by 210 bins. The additional cooler space allows the Belisles to store more of their apples on the farm to sell locally and diversify their operation. The cooler was built at the farm where there is a packing line, juice line and wholesale commercial kitchen. Each January, BelleWood Acres cleans out the cooler to make room for the next crop. They fill 52 totes with what will be apple cider and spirits after the fermenting and distilling process. FSFLs provide low-interest financing for producers to build or upgrade farm storage or handling facilities to store eligible commodities they produce. The maximum loan amount is $500,000 with a minimum down payment of 15 percent. Loan terms are up to 12 years. The Belisles learned of the FSFL program through their FSA county office electronic newsletter and recently paid off the loan. The Belisles now sell wholesale and retail. Since they can store more apples on the farm, produce and farm products are sold at the Bellingham Farmers Market, Haggen Food Stores and Community Food Co-ops. With additional cooler room, the Belisles decided to take it a step further and added a distillery to their operation. 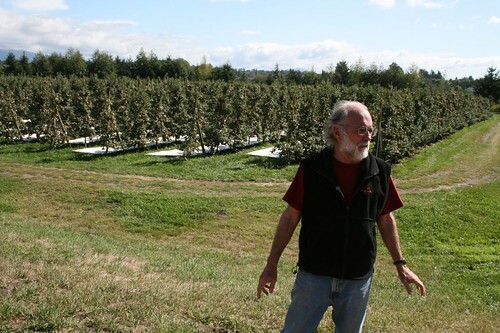 The imperfect apples are used to make spirits at the first “farm to glass” distillery in Washington State. They used a USDA Rural Development (RD) Value-Added Producer Grant (VAPG) that matched their financial contribution. The goal of BelleWood Acres is to be a destination. The retail store sits off the state highway and offers 21 varieties of apples, sparkling cider, farm-ground peanut butter, caramel apples, pies, pastries and more. Visitors can shop the retail store, tour the distillery to learn about the process of growing, fermenting and distilling before ordering a bite to eat at BelleWood Acres Country Café, all while enjoying the view of Mount Baker. BelleWood Acres also has a u-pick apple orchard and pumpkins in the fall. For more information on FSA programs, visit www.fsa.usda.gov or contact your local FSA office. To find your local USDA Service Center, visit http://offices.usda.gov. Fortunately, I found your great Office and willing to ask some answers for me, which will help me to do in my life. I'm Hasta Gautam, live in Austin, Texas, and used the wheelchair and spent time all the day at home. Life is really boring without income and I have no any sources of income to care my two kids and wife. But, still not give up hope, still trying to found the good way to work even stay at home. If I have financial support I would like to do organic farming in Texas or starting small business to sale the organic product in Texas. So, I have the plan to establish Aroma Nepal company and sale the online market organic products and for that, I need the certificate to sale the organic product. Because I love organic product and I have skills too. I have no idea in Texas where from I can get organic product selling authorize support. And also give me your helping hand to start the small business to suppliers organic product and I can work in this field. I don't want to isolate with others income. I can stand up on my own ability. I hope I will get your energetic message to do something in my life. I am really frustrated and even trying to do something. So please let me know some resources where I can work and get perfect way to catch my dreams to be able to work in my life. @hasta gautam - thank you for your comment. Most farms and businesses that grow, handle, or process organic products must be certified. The Do I Need to Be Certified Organic? fact sheet is a useful tool as you explore your business options. The Technical and Financial Assistance for Organic Producers fact sheet provides additional guidance on available resources. I want to Export apples and apple byproducts to India.Please provide Procedure for Export of Agricultural Products. Just a note - Bellingham is not the last town before the Border with Canada, and those farming towns should be recognized not minimized in the article. @C - thank you for your comment. We have made your suggested correction within the blog.